Space is a frightening place, even without the monsters; a soundless, airless void where nothing can survive. Even in the most well-fortified spaceship, you're still moments away from death. Science fiction movies and novels have explored this primal fear on numerous occasions, with classics films like Alien capitalizing on the fact that the only thing more hopeless than being trapped with unidentified flesh-hungry creatures is to be trapped with them millions of light-years away from home. Now EA hopes to translate that experience into a video game with the release of Dead Space, a twisted tale of horror, madness, and betrayal set within an abandoned deep-space mining colony. Have they succeeded in creating something truly terrifying, or does Redwood Shores' effort evoke more laughter than screams? Oh The Horror: Dead Space does an amazing job of scaring the piss out of the player. The lighting, the sound, the enemies, and the situations you are put in all come together to deliver a truly terrifying experience. By the end of the game you'll be used to the creatures popping out and dropping down, but damn if getting to that point isn't a nerve-wracking experience. In Space, You Can Hear A Lot, Actually: The sound design in Dead Space deserves special recognition in creating one of the eeriest atmospheres I've ever spent twelve hours traipsing through. While you get the standard horror game whispers, mutterings, bumps, and screams, it's when you're out in the generally soundless void that the sound design truly excels, muting to the point where you feel the sound rather than hear it. Twisted Tales Of Space: Dead Space's fiction is a rather twisted tale of religion, science, and madness. It kept me guessing up until the very end, at which point I realized I had guessed wrong, and that doesn't happen to me too often. The only thing I saw coming was the very end, just before the credits roll, though I suppose it had to be that way. Audio, video, and text logs only make the game that much deeper. The HUD-less Spaceman: The fact that the game has no HUD to speak of is a key factor in the immersive atmosphere of Dead Space. Your health and power indicators are on your back, your weapons display all contain displays showing the amount of ammo you have left. The only time you access a screen during normal gameplay is to open up your inventory, and even that is a projected image rather than a floating box. Fun With Gravity: Story and presentation aside, Dead Space is a relatively standard third-person shooter until you find yourself propelling yourself through space from platform to platform in zero gravity environments. Some of the game's most impressive moments come during moments of weightlessness, and the physics engine governing objects in motion is very satisfying. Space Engineering 101: Upgrading equipment using the tool bench is an excellent way to customize the game to your liking. Finding power cores, needed to upgrade weapons, armor, and gadgets, almost immediately set me thinking about what I was going to modify next, should I make it to the next workbench alive. Being able to focus power on the weapons you are comfortable with is a major plus. Magic Enemy-Proof Doorways: When you are trying to create a video game that scares the bejeezus out of people, you might want to allow the enemies to pass through doorways. I don't know if they are allergic or what, but most of the time the enemies in a room will stay in the room, allowing you to take potshots from the other side of the door. Big, Dumb, And Ugly Bosses: The bosses in Dead Space are weak, compared to some of the regular challenges you encounter while playing through the game. They are certainly impressive looking, but become far less so when you realize that all you have to do to kill them is strafe and shoot. Creating a survival horror game that truly excels is a rather delicate operation, with many factors to take into consideration. You have to create an atmosphere that is fantastic while still feeling like a real place. You have to have a protagonist who is well-equipped to handle the situation, yet not so powerful that the threat is lessened. You need a story that twists about and keeps the player intrigued without slipping into the realm of the ridiculous, a task made even more difficult by combining a science fiction setting with a horror theme. 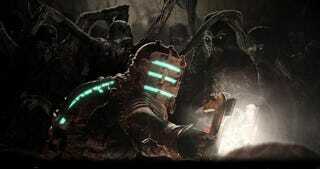 The developers of Dead Space have managed to hit every mark, crafting a game that defines what sci-fi horror should be. Dead Space is a masterful combination of two different genres that will keep your knuckles white around your controller until the ending credits roll. Dead Space was developed by EA Redwood Shores, published by Electronic Arts. Released on Oct. 14 for Xbox 360 and PlayStation 3, Oct. 20th for PC. Retails for USD$59.99 on console, $49.99 PC. Played story to completion on standard difficulty.